This past July my husband was riding his bicycle home from work when he was hit by a truck. My hubby was in the bike lane and had appropriate lighting on his bike; he always wears a helmet for safety and follows the rules of the road for bicycle riders. When the truck hit him it did not knock him down, however, it did rip the truck’s side view mirror off via my husband’s arm. The truck did not stop and my husband was left on the side of the road unable to feel anything in his arm. Knowing my husband, he would have loved to chase the truck down, but since he could not feel his arm he decided to call 911. The first unit to respond was the firefighters from Station#3 in Roseville. Was he ever glad to see them! Fast forward to the present. My husband’s arm is fine besides the scarring. No broken bone but there was extensive tissue damage. I think it must be the gallon of milk he drinks every day that kept his bone from breaking. They never found who the driver was, so it is just a hit-and-run at this point. The truck’s mirror is in police evidence, so maybe one day a match will be made. All that matters is that my husband is ok. Did I mention this happened on his birthday? So we piled the family in the car and set out on our journey to make the basket. 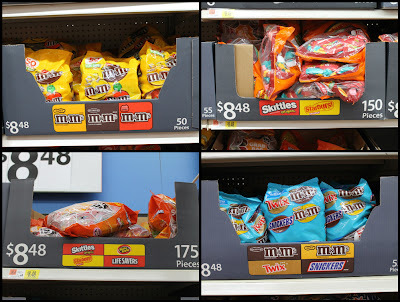 Our first stop was at Walmart and we were on a mission for Mars candies, especially mini Snickers! 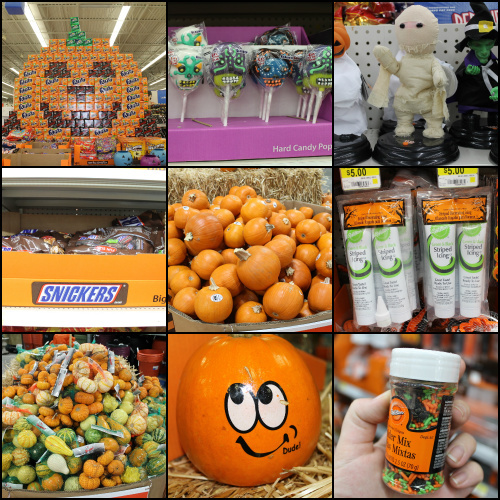 Of course I found a bunch of other goodies there too – their Halloween department was packed with awesomeness. This was the first gift basket I had ever made and I have to admit, it was a lot easier than I thought it would be. 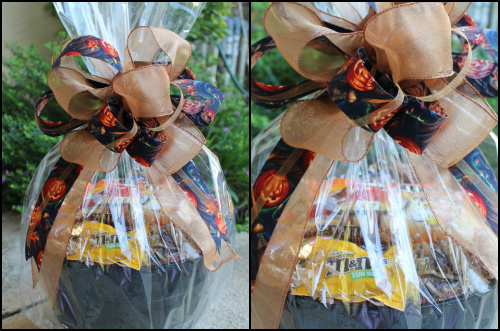 First I put a $1 store bowl upside down in the bottom of the cauldron as filler, then I added the crinkle fill, topped with candy, placed basket in cello bag and tied with a bow. Easy as pie… as long as you have an awesome neighbor who can make a bow for you! It was great to give back to the firefighters. 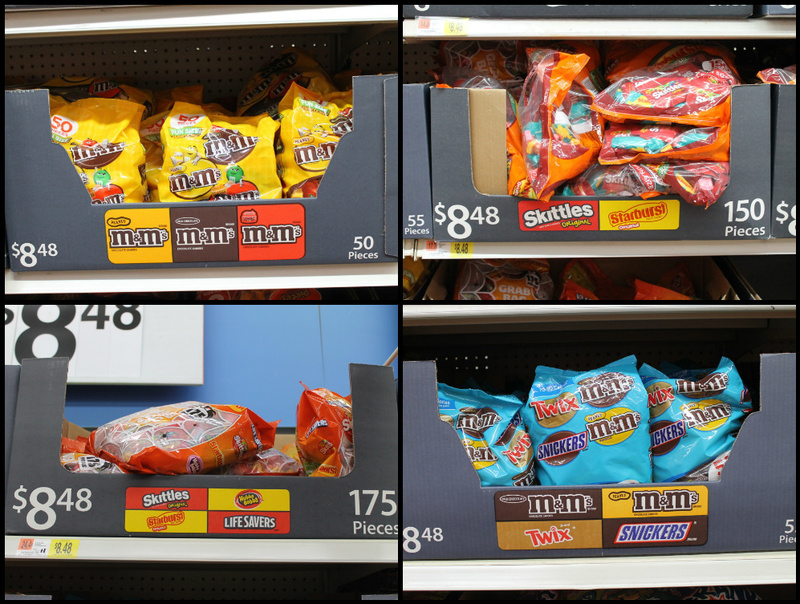 It was just a basket of candy, but it shows our appreciation for their hard work. All too often the important men and women of our communtiy get forgotten, or just taken for granted. It is important to show how grateful we are for the individuals who try to make the community a better place everyday. It was fun doing this project with my husband and kids, we had a blast and it was all in effort to give back. Check out my shopping experience here at this moment. So nice! I love the pictures!! I am glad your hubby is ok! Love the fire department. So cool you gave them a yummy basket of treats. Loved the basket and cellophane it looks beautiful. OH wow!! How scary...so glad he's ok. Very thoughtful for you to give the fire department this basket - which looks wonderful, by the way. Whew! Glad you hubster is alright and is now healing. How thoughtful to want to show your gratitude to the firefighter; I'm kinda prtial to those guys! Wow I'm so sorry that happened to your husband and I'm glad he's ok! Your basket turned out beautifully, the firefighters must have loved it!